Cultural Wormhole: The Walking Dead - "Vatos"
Rick (Andrew Lincoln) explains to the others why he needs to rescue Glenn. "Vatos" is a bit of an odd episode. Rick, Gleen, T-Dog, and Daryl's venture back into Atlanta seemed complicated enough. 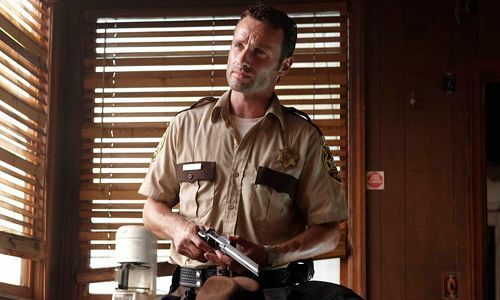 Their goal was to find Merle and Rick's sack of guns, all the while avoiding getting chewed on by zombies. Then the Vatos show up. I can understand the desire on the part of he writers to introduce the idea of other groups of humans fighting to keep their people alive and how that may run counter to Rick and his people's own needs, but this seemed too much of a detour. The tension and further deflated by Guillermo's granny popping up in the middle of the standoff. Turns out that Guillermo and his gang are guys that worked at nursing home. The doctors and nurses abandoned the old people so he and a few others stayed to protect them. Their numbers increased as more people came along and decided to stay. The idea is interesting, but the execution felt a bit sloppy. Once the truth comes out, Guillermo becomes a completely different character. The tough guy completely melts away. It's a really abrupt change and the sequence of events could have been handled more smoothly. Back at the camp, Shane deals with Jim's bizarre grave-digging behavior a lot more peacefully than his beatdown on Ed last week. Once Jim cools down, he realizes that this actions were freaking everyone out. Like a lot of the survivors, he's lost loved ones (specifically his wife and kids) and that will certainly take a mental and emotional toll on a person. Andrea, Amy, and Dale are also developed further in this episode. We get a nice conversation between the sisters about their age and personality differences and how they were treated by their father as a result. This also allow us to care about Amy once she's attacked by the walkers and feel for Andrea's loss. Dale begins to take on a quieter leadership role in this episode. He's older and less physically imposing than Shane, but people like Dale and they respect him. The group trusts him, even if he's not really trying to be a leader. Jeffrey DeMunn does an excellent job of conveying Dale's warmth and sincerity. The walker attack on the camp is quick, terrifying and gruesome. I continue to be surprised by the level of violence that is allowed on this basic cable show, even at a 10PM time slot. Given the nature of the world these characters now live in, I wouldn't say it isn't unwarranted.